The Kindle Android rumors surfaced again on Friday. The NY Times noticed that Amazon are hiring Android developers at Lab126 (they develop the Kindle hardware and apps) and jumped to the obvious conclusion. 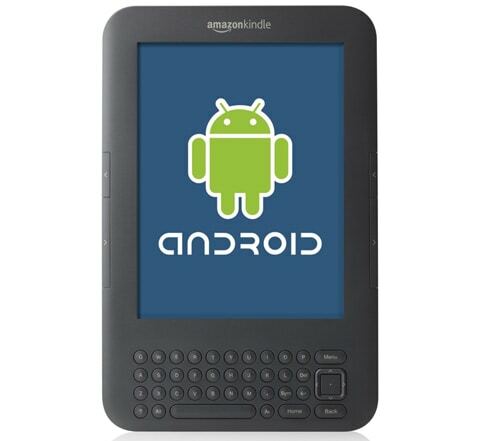 Amazon must be working on a Kindle that runs Android, and that this new device could have a color screen. There are a couple holes in that idea, unfortunately. The first problem with this rumor is that this isn't the first time that Amazon have hired Android developers. This same rumor went around the blogs back in August of 2010. In fact, the August rumors mostly trace back to the same blog on the NY Times website as the current rumors. Guess what? Both posts suggesting a Kindle Android tablet were written by the same author, Nick Bilton. If he was wrong then, what are the chances he's right this time around? But a bigger issue is that everyone shares a blind spot when it comes to new stuff. We all assume that a developer is working on hardware, not software. There's no reason for this assumption, but it exists all the same. I think we make this assumption because it's easier to conceive of a physical object like a gadget than it is to think of something as ephemeral as software. You can't touch it, so it slips your notice. Take Sony, for example. In August of last year Sony started hiring Android developers to work in their Sony Reader division. Everyone jumped to the conclusion that Sony was working on an Android ereader. They weren't. A few months later Sony announced that they would soon have reading apps available for iOS and Android. That Android app was released back in January, and you know what happened to the iOS app. I was the source of the Sony story, and lucky for me I didn't fall victim to the blind spot. I didn't assume it was either software or hardware. (Sometimes my foresight amazes me.) I'm pretty sure I was thinking that Sony was developing reading apps, but that isn't clear from my post. But 3 different blogs credited me, and they all assumed that Sony was working on an Android gadget. They were all wrong - and that's the blind spot. You could argue that past performance is no way to predict future behavior, and this is true. But that doesn't mean that the hardware assumption is a valid one. We don't know why Amazon is hiring Android developers. TBH, any argument I could make in favor of software is just as invalid as the hardware assumption I debunked, so I'm in something of a pickle. We don't know. Everyone’s waiting and some are just rightly speculating – no one has said it IS so, except in one case, in a quote by a Computerworld columnist. Programs just take -forever- to do and test and get right, no ? Not only does the hardware need to be right — at least as much so, the software. And we wouldn’t see it until it’s ready. I’m sorry, but what do mean about 1 month? Nick is repeating the prediction he made back in August. It hasn’t come true yet. And TBH, the real reason for his blog post is SEO, not journalism. kindle+tablet gets a lot of attention. I meant in ‘a’ month and if you had followed the link to my site story on this, you would have noticed someone else heard from Amazon sources they WERE going to produce an Android tablet. I don’t understand this from you. If someone is going to be working on a tablet – it involves hardware and software working together well and the only companies that come out fast with something like this quickly DIE. Look at all the companies putting out tablets and being beat up because they have so many problems. How can you say he was “wrong” and there was no reason he would be right this time. Programs take forever, to make sure they’re right and in Amazon’s case they have a lot of things to think about before quickly delivering a lemon. So in no way was Bilton wrong. It’s just that we see nothing’s within 6 months and that is just normal. And I do think they’ve been working on designing one. Honeycomb is now held up as of yesterday for other manufacturers because of problems encountered. it’s foolish to rush even if offshore companies produce hardware right away, with problems. Difference is, Sony apparently does have an Android tablet in the works. Don’t know if they’ll ever decide to release it. Yes, but the job listing that started the Sony rumor came from the Sony Reader people, which was eventually revealed as an app, not a tablet. And when they do, Mike, it’ll be more expensive than the others because that’s their way. I like my NookColor but it is SO buggy !!! But in April maybe they’ll fix some basic things when they come out with the one that runs Flash and one other thing it’ll do that I can’t remember right now. Others with malfunctioning chargers were told they were out of them ! Out of the charger? It was weeks that people had to wait and calls are not returned. Normal books can’t zoom pictures and you can’t read in landscape on the 7″ screen on a book. I really like the magazine features though and the web is very pleasant and gorgeous on it, but weird things keep happening on it.